Thoughts from the Hill: What a Busy Day!! I took 2 large garbage bags and 2 boxes of stuff to the second hand store today. That sure makes our room look alot less cluttered. :D After we dropped the bags and boxes off, we went in to see what bargains we could find. 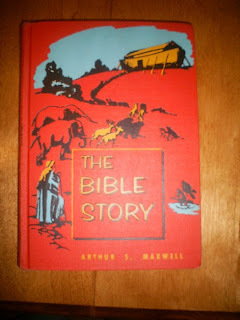 My in-laws had given us some Bible Story books by Arthur Maxwell. 4 of the books were missing. I was able to get 3 off of eBay, but I still needed Volume 1. Well, what should I find today but Volume1! I am surprised that I even noticed it because the edition I found looks nothing like the rest of the books we have, but hey it still completes the set. The book I found today is smaller but thicker and it is red. The other ones we have are blue. lol :o) I am thankful to have found it and that it only cost around $3.50 total. :D Here is a picture of my find.